Scottish FA chief executive Stewart Regan is being considered for the Football Association's general secretary role, the BBC has learned. Alex Horne will leave the post on 30 January after four years in the job. The position was advertised last weekend and Englishman Regan, 50, is under consideration. Regan joined the SFA in July 2010 after four years working in a similar position with Yorkshire County Cricket Club. He succeeded Gordon Smith, who ended his three-year spell in the role for personal reasons. At the time, Regan said he aimed to "achieve the obvious common goal of improving the overall standard of the number one sport in this country". Then SFA president George Peat, who appointed Regan, said at the time: "Stewart's got a business background and that's what we're looking for. 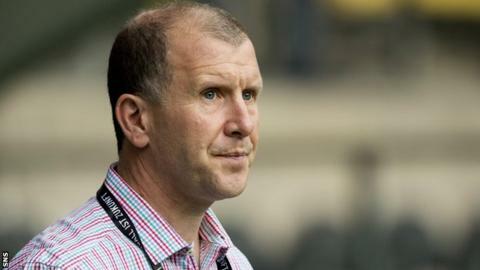 The SFA has a £30m turnover - it's a business we're running here." Regan has indicated previously that he would stay in the SFA chief executive role until Henry McLeish's report into the Scottish game has been implemented. Former first minister McLeish's two-part report in 2010 advised on changes to youth development and the governance of Scottish football. Since then, the SFA has implemented a performance strategy spearheaded by Dutchman Mark Wotte. However, Wotte left his performance director post in October, indicating he could do no more in the role. Scotland's national team have experienced improved results since Regan and the SFA board appointed Gordon Strachan to replace head coach Craig Levein in early 2013. The Scots remain in contention for qualification from Euro 2016 Qualifying Group D.
The closing date for applications for the FA role is in mid-January. Horne spent 11 years in various roles at the FA and oversaw the opening of the £100m National Football Centre at St George's Park.